Me: HI! I SAW THE DRESSER YOU JUST POSTED ON CRAIGSLIST, IS IT STILL AVAILABLE?? Nice thrift store lady: Yes, we have it here. Me: CAN I COME BUY IT DURING MY LUNCH BREAK AND PICK IT UP LATER?? Nice thrift store lady: Yes, that would be fine. Me: GREAT, I WANT IT REALLY BAD! Nice thrift store lady: Ok, we're here all day so just come in whenever you can. Me: OK! SEE YOU SOON! Then, I got off the phone and realized she didn't have my name or number and someone, ANYONE could just walk in there and buy MY dresser! So, I did what any normal person would do...called back and gave her my info took my lunch break at 10:45, stopped at a Walgreens to get cash, sped through yellow lights and got there at 11am with cash in hand. She said another girl had called right after me and she was worried that the other girl would get there before me. Whoa. Also, when I got there three other ladies were milling around opening the drawers on MY dresser! I got there in the NICK OF TIME. I paid my $42, called my dad and screamed that I needed his truck ASAP asked him nicely if he could meet me at the thrift store at 5:15 with the truck, and then went to check out the dresser again. There were more people looking at it. 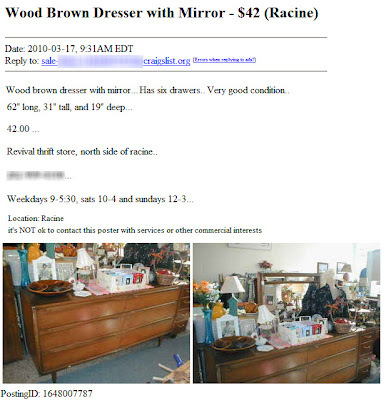 Nice lady had put a sold sign on the mirror portion (which was priced separately and I wasn't buying it) so I found the price sticker on the dresser itself and wrote **SOLD** in pen, just to be safe. I also contemplated taking a vacation day from work just to sit on the thing until my dad could come. I didn't do that, though. I asked her repeatedly if it would still be there when I came after work, and she promised, gave me a receipt, and her cell phone number. I still didn't want to leave. I can't wait to get that baby home and refinish it! Even with the dark walls, it would be rad to stain this bad boy a nice rich color like John and Sherry did with their very similar dresser. It is a nice thick veneer, so it definitely could be done. I could even match it up to my floor stain instead of going darker. Ha! I totally know that sweaty-nervous feeling when you think everyone wants what you want! I can see why you might want to stain, but I think a high-gloss white, maybe even a hint of pearlishness, would really pop in that space. I say stain that baby; painted furniture is pretty but I'm always afraid to do something so permanent to nice furniture. It'll be plenty glossy with a nice new coat of poly on it! Great find! Ah! I love it! Great find! I think it would look FAB in white but also love the idea of a rich stain...hmm...decisions decisions! You can achieve the white pop in other ways, and I'm sure you will- you're so creative! I have to tell ya... I think painting it would really work in that room. I fear that staining it will just make it disappear in the room. Ps- If you do decide to paint, who's to say that one day you cant just sand everything down back to the veneer and stain it eventually.... is that possible lol?? It's gorgeous!! Stain it all the way. We used to use a mid century modern dresser as our TV stand and that baby was stained MANY times before we got a hold of it; and it's still in decent shape. No joke, I would of done the same exact thing! I always think someone else is after my finds also! lol. Hmmm...I think I need to see it against the walls first before I make a judgement what to do with it. I am thinking white right now. Wow, this is exactly what we've been looking for! Everything I've seen lately has been chipped beyond repair. Your find is gorgeous! I'd personally stain it, if it were mine. however, I think white would look best with your chocolate walls. Interestingly enought I just blogged about a similar find last week. Ok I have a two step process ..... I think you should stain it. If you are not happy with it, you and always paint it .. but it's harder going the other way. See I can't make a decision either. I think it would look fantastic in white against that wall, but I think I'd be scared to paint that piece. Oh my gosh, I LOVE it. I am so jealous. This post is hilarious. I seriously started cracking up when I read it. My vote is to stain it. I stained a very similar piece and I just love it. And as Sharon said, if you hate the stain you can always paint over it. And I'd definitely paint it. Ha. I've been there! That piece is totally worth it. Great find!! I think you could do a white/stain combo. I've been really wanting to try that on a piece of furniture! You could do the drawers white and the top and side stained or vice versa...I think that way it would still pop against the wall. Ok, first of all, can I just tell you how RIDICULOUSLY JEALOUS I am??? That piece is amazing and exactly what I've been looking for as well!! My question is what does the current finish look like in person? Maybe post a pic of it in the room 'as is'? Personally, I'd just have a hard time committing to the idea of painting/staining/otherwise altering an original piece like that (unless it's outright ugly or in bad shape already). Kerry, it's in pretty good shape. There is some white paint on a few of the edges, I'm not sure how it got there. I need to inspect it closer because so many people were crowding around it in the store. Omg that would be closer to 400 dollars here in Toronto!! Gah! Great find. I say paint it. For 42 dollars, you can't really lose! Great find and tough decision! My vote goes to painting it simply because I love the look of painted furniture. Ha! Awesome!!! I have been searching Craigslist for a dresser for months and the one time I found a good one, it was already sold. Way to go!! Can't wait to see how your refinsih it. ohmygosh, i LOVE that dresser! SCORE! I like that you took matters into your own hands and put a SOLD sign on the dresser... awesome! Maybe you could do the two-tone thing like YHL? Whatever you do will look great I'm sure. Congrats and color me jealous of your fab new dresser! What a find! I actually love the wood tone. You'll make the right decision, whatever it may be. Haha, this was a very entertaining story! My palms were sweaty for you! What a steal... I could only hope to be so lucky someday. I really like the two-tone thing that John and Sherry did with theirs. 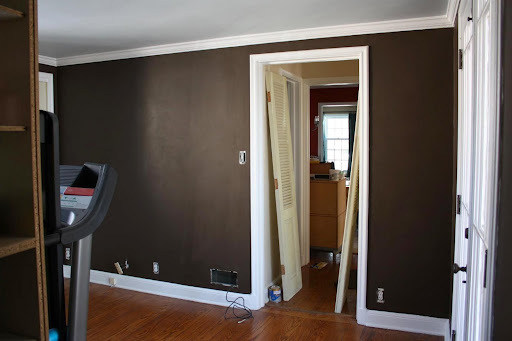 It would help lighten up the walls and tie in with the trim, without painting the entire thing. Defiantly a dark stain I would say. Or you could be super crazy and paint it yellow! or Orange... for $42 either way you'll have a fabulous piece! Sara, what a story! I just went back & looked at all your projects & WOW, what a great job. I think I've been over here before, but maybe not. You've been a busy girl. Love your story about this find. Sounds like something I would do. Rush out of work for an early lunch just to buy something on a great deal. Yep, done that myself! You found a great piece. Why don't you try doing the same finish that J&S did, I love how their's turned out. So glad I came by here. Love your house!! "I also contemplated taking a vacation day from work just to sit on the thing until my dad could come." you made me laugh. :) congratulations on your purchase, now let's see it in the room!! what a find - I NEVER find anything that awesome on my local craigslist! That's how I felt about my yellow chairs. Only this is even better! I am jealous that the MCM style goes with your house. What a find! I agree with everyone else....try stain first and if it does not work you can always paint. Either way it will look stunning!